Isn’t that pretty? In this small version here you’re not getting the whole effect, so I strongly encourage you to grab a bigger one. UGC 9128 is pretty close as galaxies go, lying about 8 million light years away. Only a handful of galaxies are closer; this is only a little more than twice as far away as the much more famous (and far, far larger) Andromeda Galaxy. But it’s so diminutive it’s very faint. It’s only about a hundred million stars strong — compare that to the 400 billion in the Milky Way! — which is why you’ve never heard of it. From stem to stern it’s perhaps 3300 light years long; again, tiny compared to the 100,000 light year breadth of our galaxy. But in this Hubble image it’s very lovely. This is a false color image; what you see as blue is actually orange light from stars, and red is near-infrared, just a bit farther out in the spectrum than the human eye can see. These two filters are used because they do a good job of separating out different kinds of stars, allowing astronomers to sample the stellar population of the galaxy. There’s quite a bit of evidence that these galaxies collide and merge to form bigger galaxies, and we know that big galaxies like our own still sometimes gravitationally gobble down such small galaxies, ingesting them like cosmic cannibals, growing larger in the process. 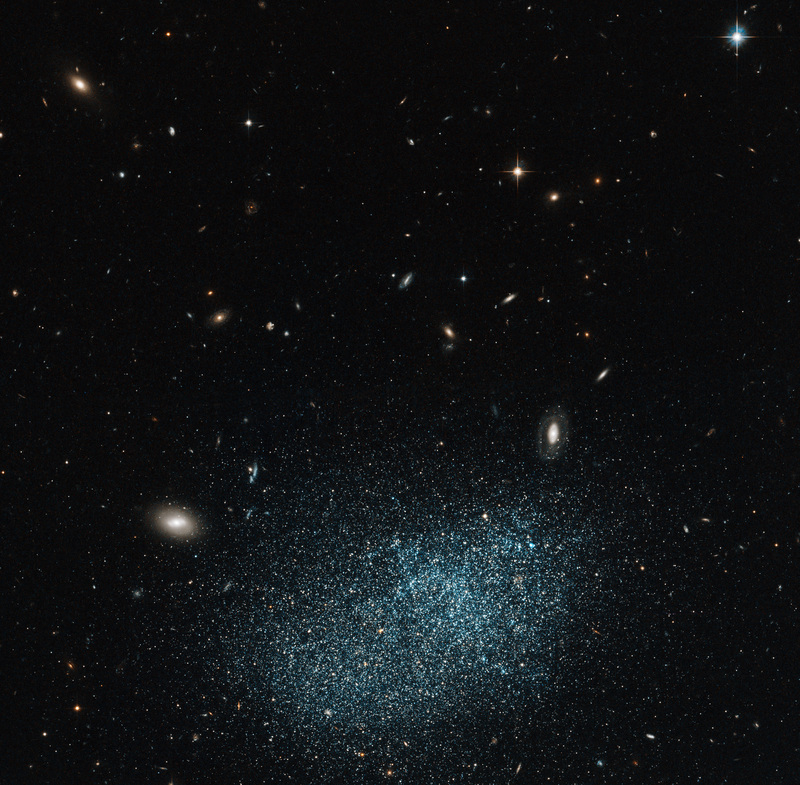 Studying dwarfs like UGC 9128 gives us insight into how this process occurs. This particular galaxy lies in a part of the sky to our galactic north, where our own galaxy is thinner. That’s why there are fewer foreground stars than you usually see in a Hubble picture, and lots of background galaxies. Those galaxies are much farther away, certainly hundreds of millions of light years, and the smaller ones are probably more like a billion light years distant! That may give you an idea of just how small UGC 9128 is; I picture it like a cotton ball held in front of my face, with those other galaxies being serving platters clear across the room. But again, these galaxies may dominate the Universe… after all, how many cotton balls do you have in your house compared to the number of serving platters?